NASA’s Hubble Space Telescope has taken photographs of some of the brightest infrared galaxies in the universe. This has become possible due to a natural phenomenon called gravitational lensing, which is a means of magnification. Here’s how it works: the gravity of a galaxy or cluster of galaxies intensifies the light from a background source, which causes our perception of the background source to be magnified and slightly distorted (like looking at an object that sits at the bottom of a swimming pool). Basically, we get an intensified and a somewhat warped look at these galaxies. 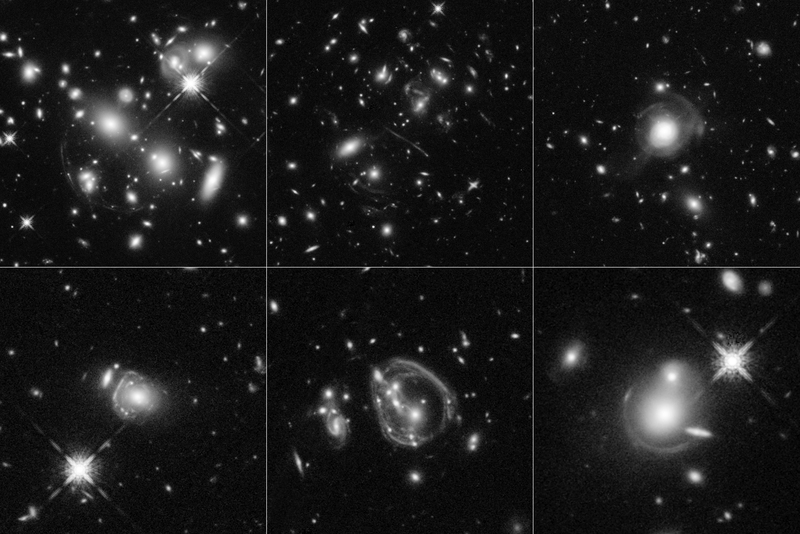 Scientists at Smith College in Massachusetts just discovered what is being called the “jackpot of gravitational lenses,” which enables us to study them in exceptional detail and see features as small as 100 lightyears or less across! The galaxies the “jackpot” magnifies are extremely rare—there are only a few dozen in the whole universe. They are ultra-luminous, massive, star-burst galaxies. They are so bright because they are in the constant process of runaway star formation (runaway stars are those with unusually high velocities). In fact, they produce over 10,000 stars every year, about 5,000 times the star birth rate of our galaxy, though they only use as much gas as the Milky Way does. So the big question is this: what could be maintaining this extraordinary production rate? One idea is that these galaxies are distantly related to ultra-luminous infrared galaxies, whose star production rate is maintained by the merger of two spiral galaxies. Another idea is that excesses of gas are overflowing into faraway galaxies, which means more material with which to make stars. "The early universe was denser, so maybe gas is raining down on the galaxies, or they are fed by some sort of channel or conduit, which we have not figured out yet," said lead researcher James Lowenthal of Smith College in Northampton, Massachusetts, "This is what theoreticians struggle with: How do you get all the gas into a galaxy fast enough to make it happen?" The research team is in the process of studying this wonder with the help of the Hubble Telescope, and eagerly look forward to the launch of NASA’s James Webb Telescope in 2018 which will measure the speed of the galaxies’ stars, enabling the scientists to determine their mass. #GetExcitedSU !